The first University of Suffolk graduation ceremonies have been held on the Ipswich Waterfront. 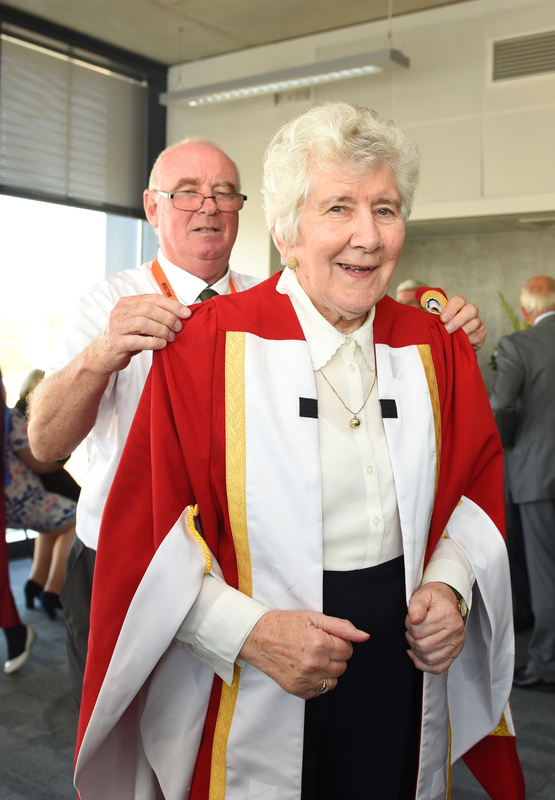 Alongside the students being presented with their degrees today was Patricia Godbold who received an honorary doctorate. Born in Ipswich in 1935, Patricia attended Orwell Junior School and Nacton Road Secondary Modern Girls School. Patricia went to her first Ipswich Town match at Portman Road after World War II in 1946 with her father. In 1954, she applied and was successful in gaining the post of Secretary to the then- Manager Scott Duncan. Patricia worked for nine managers including Sir Alf Ramsey, Sir Bobby Robson and George Burley. Patricia was PA to Sir Bobby Robson for 36 years and Company Secretary to his commercial business, at the same time working for four Chairmen and four Company Secretaries. Patricia retired from working full time in 1997 and in 2004, on behalf of the Football Association, the Governing Body of Professional Clubs, David Sheepshanks the Club Chairman, presented Patricia with a medal for 50 years loyal service to football. Patricia is now the club archivist looking after memorabilia and answering history enquiries. She also helps to organise former Town players’ annual reunions. University of Suffolk Honorary Mick Mills attended Patricia’s ceremony. Mick was just 21 years old when Sir Bobby Robson appointed him as captain and he went on to lead his team to FA Cup glory in 1978. Three years later he collected the UEFA Cup as Ipswich celebrated European success and in 1982 he skippered England in the World Cup finals in Spain. He said of Patricia’s recognition, “I’m very proud of Pat today. She took a job all those years ago that possibly, in her eyes, wasn’t going to be a very attractive job but then it became more than a job. In many respects, it was like head of a family and that is the role she took on. She worked for some very famous managers, Sir Alf Ramsey and Sir Bobby Robson. She was there many, many years and literally took over looking after the young players that came to the club. She won’t mind me saying that she made the most of an ordinary job and made it very special. 1,402 students will be conferred at ceremonies in Ipswich this week. The graduations in Ipswich are the last of 2018. Other ceremonies have already taken place in Bury St Edmunds, Great Yarmouth and Lowestoft.